Relish the memory. : A City and Herb so Fresh it’s MINT: Part 1. A City and Herb so Fresh it’s MINT: Part 1. Two words. Mint + Melbourne. Both signature parts of the recent adventure that inspired, excited and tantalised tastebuds. A delightful mother-daughter trip across the ditch to taste the hub of cutting edge cuisine and enjoy the food-lovers playground that is, Melbourne City. With a simple herb making its presence known on various plates throughout the weekend, it was the excessive dose of fresh Mint that made our trip all the more memorable. And so it began: DIY Rice Paper Rolls w. Peanut Sauce & Minty Corn Fritters. After being on the list for a few years now, I had prepared my senses to explore, smell, watch, touch, listen and ultimately taste what the Melbourne food scene had to offer. I acquired a range of research outlets to help me on my adventure – Google searching, instagram scrolling/stalking, emailing and gathering advice from local and respected food-loving personnel. Basically every meal was booked out well before I left the ground. As you can imagine there are far too many meals (ahem calories) to share in one post. So without further or do I give you just a few of my mint-related morsels and Melbourne moments. 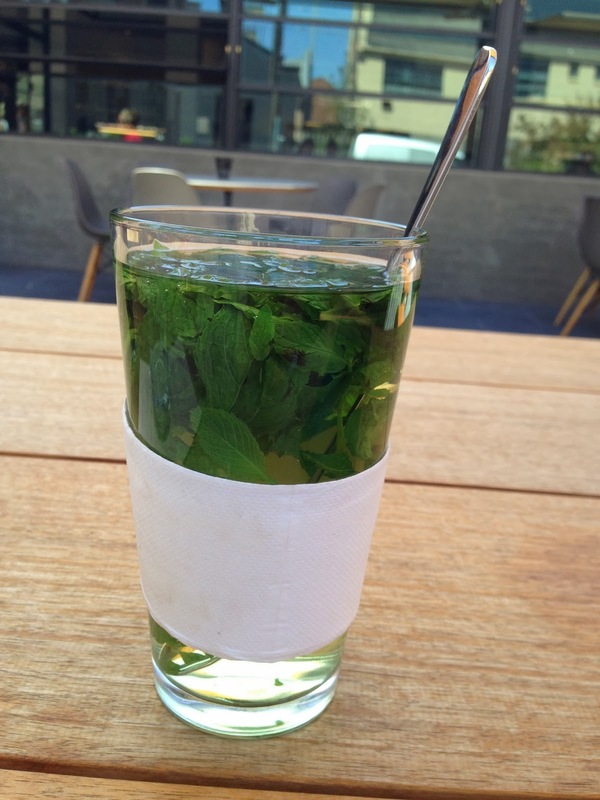 Let’s start with ‘Fresh Mint Tea’, this tall luscious glass of boiling water and a wad of that cooling, fragrant herb. Found at the sparkling new Allpress Roastery in Collingwood, Melbourne. This local, flagship store is a welcome addition to the successful kiwi-born coffee empire. With a winning combination of sublime coffee, intriguing food, magically crafted architecture and a sunny courtyard to forget all life’s worries. I also know a certain creative creature that plays here, a truly talented artist both in and out of the kitchen. Spicy Corn & Coriander Fritters w. Chilli Jam, Iceberg wedges & Fresh Mint leaves! I can assure you, that despite the pun everything really was MINT. And true to its Asian flair many of the dishes starred this luscious fragrant herb. Spicy Corn & Coriander Fritters served with chilli jam and lettuce cups (I see you drooling) were assembled and devoured instantaneously. These little beauties were sensational, such a perfect balance of flavour, spice and texture. Crunchy iceberg shells, encased the crispy fried fritters, filled with sweet, juicy corn kernels, peppery coriander, a dollop of punchy chilli jam and finished with that single fragrant mint leaf. Caramelised Pork + Crispy Barramundi + Green Apple Mint Salad. Done. As Miss Piggy has mentioned before here, you’ll be hard pressed to see me by-pass a pork belly on any menu. However this dish was Mums choice, and boy was it a good one. Crispy Barramundi with Green Apple Salad & Caramelised Pork. Such an intriguing combination, that made so much sense. Encouraged by the waiter to share a bite of fish, salad and pork all together, was advice I did not need to be told twice. Words escape me. 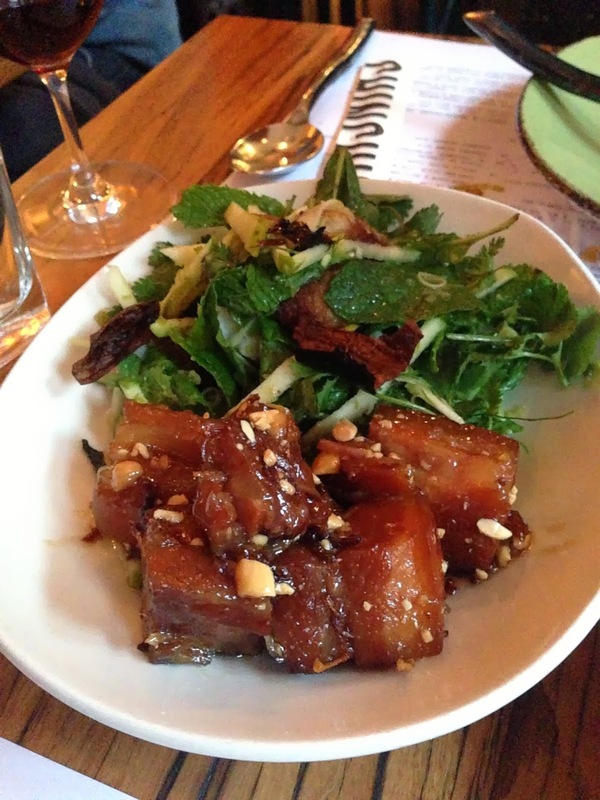 The pork drenched in caramel was next level amazing, cut through by the crunch and freshness of the apple mint salad. It was enriched even further by the golden, firm and flavoursome barramundi. Too good! All elements had their place, and with its companions - coriander and kaffir lime – for me the mint brought it together in perfect harmony. Despite a lack of mint, this final dish lacked nothing else: Spiced Coconut Curry with Fried Silken Tofu, Boiled Egg & Okra. Note the Roti to the right. Heavenly. After perusing their cookbook, it was no surprise to hear that over 500 servings of this dish are sold every week at Chin Chin. And I felt pretty special to have demolished one of them. We returned inspired, gifting the cookbook to our own culinary goddess. Following an afternoon well-spent in the kitchen with my favourite cook, we produced a seriously good rendition of the Spicy corn fritters, along with Red Curry of Roast Duck with Lychees, Pork & Peanut with Cassava crackers, a bloody good attempt on the Yellow Curry of Roast Pumpkin with Grilled Tofu and finally our take on that winning Fish/Pork/Salad combo using Kingfish, a Chinese-style Pork belly and that zingy refreshing salad. Our extended food-loving family were left replete and seriously impressed. Not one to rave about her cooking even the lady of the house was blown away with our efforts. 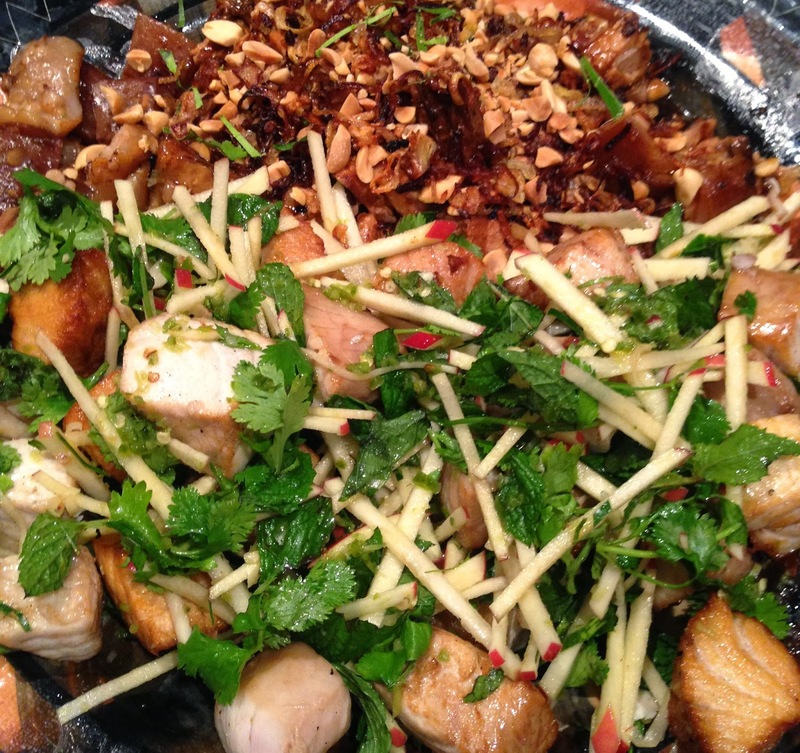 Our efforts ft. Kingfish & Chinese-style Pork Belly & plenty of toasted peanuts, coriander & fresh mint! A City and Herb so Fresh it’s MINT: Part 2.